The sweet and smoky scent of incense fills my nose and lungs from the altars that dot the sidewalks, cafés, apartments, businesses and banks of Dalat, Saigon and Can Tho. Without a doubt, Vietnam is a country of devotees. The little time that I have spent here has shown me that almost every business I enter, restaurant I eat at, house I am invited into, bar and club all have an altar. It is amazing how, despite the religious diversity, everyone that I have met practices this Ancestor Worship by putting up an altar in their home or business. They could be adorned with a variety of things: yellowed photographs of family that has passed, small statues of laughing Buddha, crucifix, mother Mary, flowers, Uncle Ho, large cellophane packages of nuts and candy, beer, cigarettes, plates piled high with fruit, etc. The potency of ancestor worship has been one of many surprises of Vietnamese Spirituality. I came to this country with my baggage of assumptions: I assumed that, because it was a Communist country, religion would be perceived as subversive to the government and would have been suppressed since 1945. I also assumed that the liberalization, modernization, and industrialization of Vietnam since 1993 would have also diluted religion, turning it into an archaic and backward idea to the young, worldly consumers. What I’ve seen/read/listened/observed instead has been the saturation of religion in the consumer culture, high involvement of youth in their spirituality, the tolerance and openness of a variety of religious practices, and the dynamic and malleable role of religion as a part of the Vietnamese culture. The most present religion in Vietnam is Buddhism, and one of my favorite parts of the country has been the visits to the many pagodas. 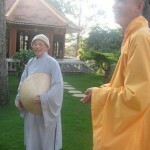 The Truc Lam Zen monastery in Dalat was an especially wonderful and peaceful experience. It was a tucked in a lush forest in the high hills and filled with kind faces, laughter, sweet smells from the well cared for plants, songs of chanting monks and nuns, and the happiest dogs I have ever seen. 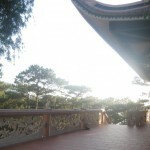 Not all of the pagodas are that peaceful, however. On the full moon this past Sunday, my friend Julie Moulton (who is embracing the world with open arms and traveling in Vietnam for the next five weeks by herself!) and I found us in a Pagoda that was packed with people praying for their ancestors and good luck in the next year. Incense was burning everywhere: in spiraled cones hanging from the ceiling, in large handfuls and stuck into the vases in front of the altars, and in large metal troughs on the sides. We could barely keep our eyes from tearing with all the smoke, and we were not the only ones. Such a beautiful and intense experience; what a way to celebrate the full moon!